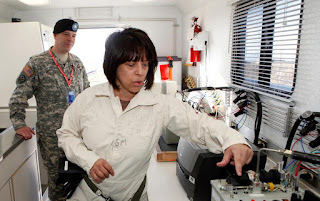 Debra Michaels, Chemical Operations Manager demonstrates a gas chromatograph inside a mobile testing lab at the Army's Pueblo Chemical Storage facility in Pueblo, Colo. The lab is used to test the air for leaking mustard agent. Depot commander Lt. Col. Robert C. Wittig looks on at left. On Wednesday, Aug. 31, 2016, the U.S. Army said that it plans to start operating a $4.5 billion plant next week that will destroy the nation's largest remaining stockpile of mustard agent, complying with an international treaty banning chemical weapons. DENVER (ASSOCIATED PRESS) — The U.S. Army plans to start operating a $4.5 billion plant next week that will destroy the nation's largest remaining stockpile of mustard agent, complying with an international treaty that bans chemical weapons, officials said Wednesday. "We've practiced a lot," Mohrman told The Associated Press. "Next week it gets real." Robots will dismantle the shells, and the plant will use water and bacteria to neutralize the mustard agent, which can maim or kill by damaging skin, the eyes and airways. At full capacity, the facility can destroy an average of 500 shells a day operating around the clock. It's expected to finish in mid-2020. The plant will start slowly at first and likely won't reach full capacity until early next year, said Rick Holmes, project manager for the Bechtel Corp.-led team that designed and built it. Construction began in 2004, but until now, the Army has been vague about the start date, citing the complexities of building and testing the facility and training the workforce. The depot has already destroyed 560 shells and bottles of mustard agent that were leaking or had other problems that made them unsuitable for the plant. Those containers were placed in a sealed chamber, torn open with explosive charges and neutralized with chemicals. That system can only destroy four to six shells a day. Irene Kornelly, chairwoman of a citizens advisory commission that Congress established as a liaison between the public and the plant operators, said her group had no remaining safety concerns. The shells stored at the Pueblo depot contain a combined 2,600 tons of the chemical. The Army stores an additional 523 tons of mustard and deadly nerve agents at Blue Grass Army Depot in Kentucky. Blue Grass is expected to start destroying its weapons next year, finishing in 2023. Mustard agent is a thick liquid, not a gas as commonly believed. It has no color and almost no odor, but it got its name because impurities made early versions smell like mustard. The U.S. acquired 30,600 tons of mustard and nerve agents, but it says it never used them in war. Nearly 90 percent of its original stockpile has already been destroyed, mostly by incineration. The Colorado and Kentucky depots are using chemical neutralization because residents and officials expressed concerns about vapor from incineration. A 1925 treaty barred the use of chemical weapons after debilitating gas attacks in World War I, and the 1997 Chemical Weapons Convention called for eradicating them. But international inspectors say Syria and the Islamic State group used them in 2014 and 2015. The United Nations Security Council met in closed session Tuesday to consider whether to sanction Syria.